For modern professionals, the Geolite range blends protection, comfort, and affordability, all in one. A durable mix of material and style offers ample storage capacity in compact, sophisticated designs. 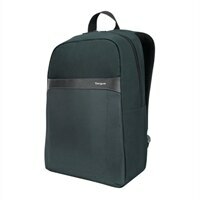 Targus Geolite Essential - Notebook carrying backpack - 15.6" - blackFor modern professionals, the Geolite range blends protection, comfort, and affordability, all in one. A durable mix of material and style offers ample storage capacity in compact, sophisticated designs.